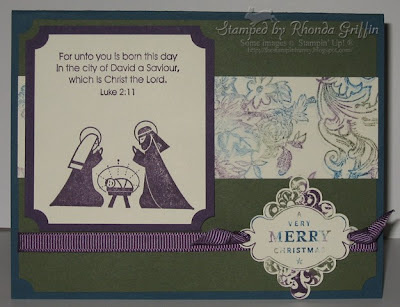 I created this card for my November Christmas Technique class. It was quick and fun. 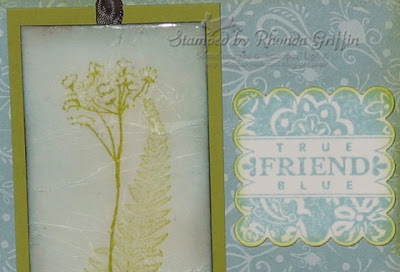 I used Baja Breeze with black craft ink and clear embossing powder. I markered-over the bleached hat and scarf after bleaching out the snowman with an aquapainter. 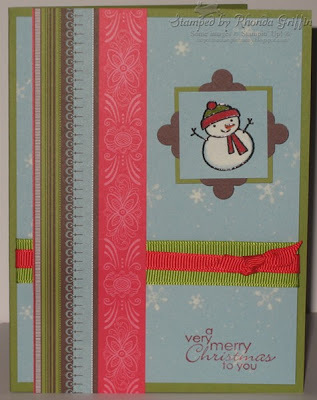 I also stamped the snowflakes with bleach, and then finished the card with punches and the new Ski Slope designer series paper. The sentiment is from the Level 1 hostess set Best Yet. 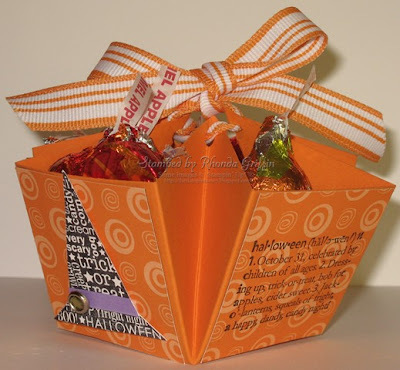 Visit Cammie's Blog here: http://myblogbycammie.blogspot.com/ to see her story and blog candy contest as well as her stamp set that benefits the Alzheimer's Association. 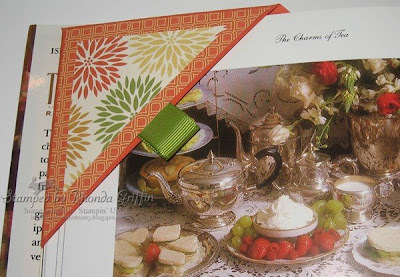 For the contest, we were to create a card for a caregiver of Alzheimer's patients. My first card is for a friend's mother. This may not be what Cammie had in mind (so I did two), but I wanted to support an Alzheimer's patient's wife who is certainly a caregiver as well. 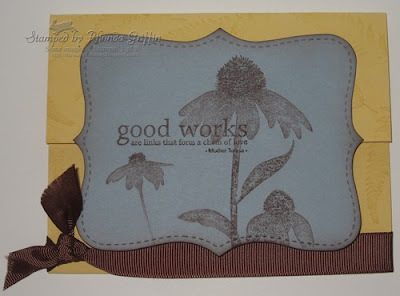 I used the Organic Grace Hostess Set, Sanded Background and my current favorite sketch by JanTInk (blog linked on the side bar). My second card I will give to my friend and ask her to ask her mom to give it to the staff or a particular caregiver as she feels led. 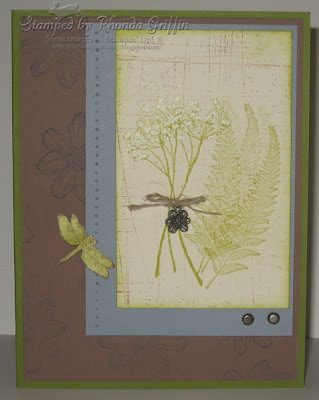 This card uses the Organic Grace fern, the Inspired by Nature coneflowers and sentiment and the Top Note SU! exclusive Big Shot die. For the technique challenge from Monday on SCS, I made this bookmark using the Haiku paper and Eastern Blooms set....and then since I had an extra bit of Tangerine cardstock, I made an OSU bookmark for my daughter using the Wanted set to create "Bullet" on the front. With football season starting, she is very aware of cheering for a team :). 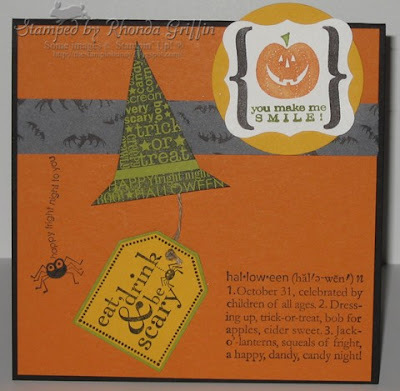 I used Reinker drops on a baby wipe for an inkpad for this card. 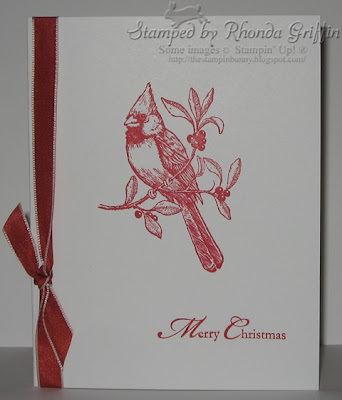 I used it on the new Bella Toile Background and for the Christmas stamp from the Punches Three Hostess set. Mary, Joseph and baby Jesus look better in the solid to me though. :) I took this color combination from one of my favorite convention swaps which I received from Connie Ingram of Littleton, Colorado. Thanks for sharing Connie! It was too pretty of a picture to pass up being inspired by :). 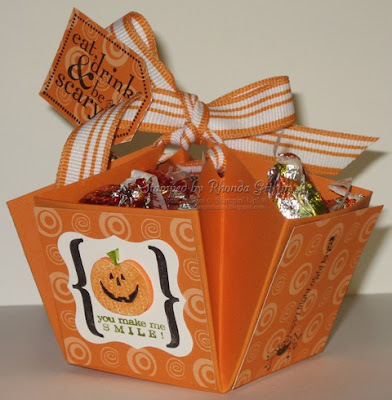 I came up with this using the new hostess sets Punches Three and Organic Grace. After using the white gel pen to highlight the flower petals, I decided to use the cracked glass technique obviously inspired by all the glass bottles :). 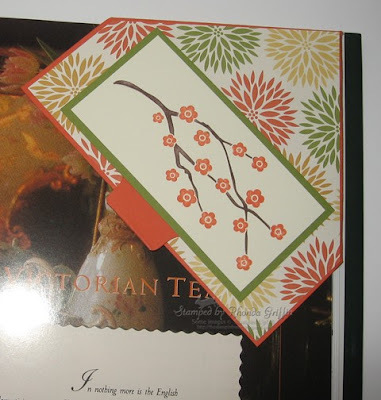 I finally finished these cards for a swap just minutes before the post office closed. Whew! 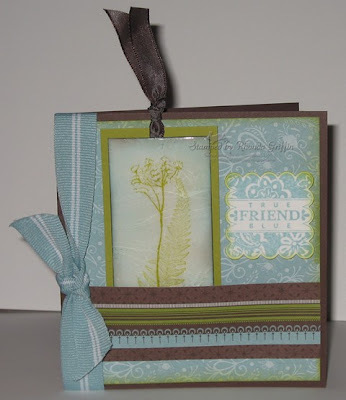 This card was made using the Happiness Is a Journey set and the Top Note Bigz Die. I sponged all the edges in Close to Cocoa and used Clear Embossing powder over Not Quite Navy craft in on Kraft cardstock. The green hue is Old Olive, and I sponged the ribbon a bit to tone it down and provide a more masculine look. Since I'm rushing Halloween, I might as well rush Christmas.....:).... 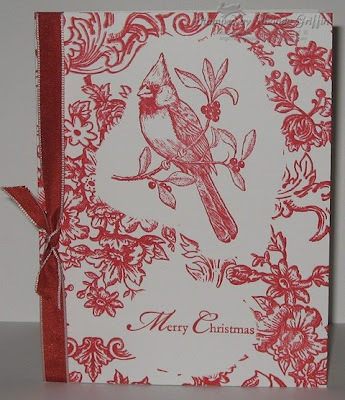 This masked A Cardinal Christmas card in Ridinghood Red and Whisper White uses the Bella Toile Background as the filler.....My husband preferred this card to the plain version below so I used the masked version for a swap. I still like the plain version :). 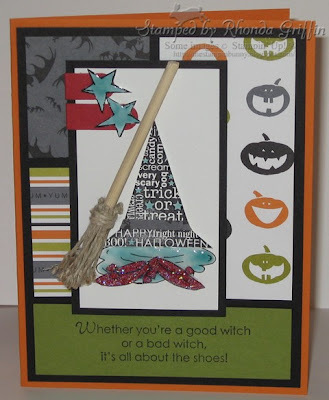 For another swap, we were required to use one of the sketch challenges on Splitcoast. 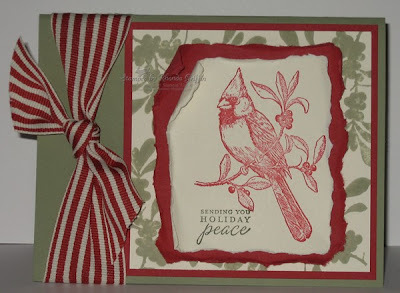 I chose SC66 for my card, and again used A Cardinal Christmas-this time with the new Wide striped grosgrain and Very Vanilla and Mellow Moss. I used a sentiment from To You and Yours in artichoke as well. 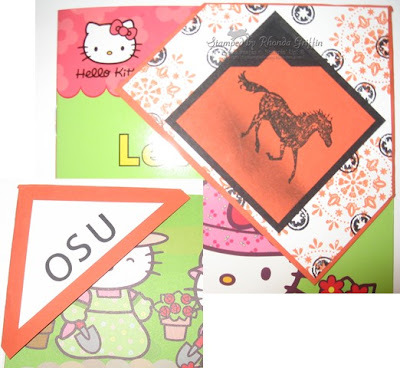 These cards are likely parts of my class or Stamp a Stack offerings coming in October.